BEIJING, April 1 (CGTN) -- China successfully sent a new self-developed data relay satellite into space from Xichang Satellite Launch Center in southwest China's Sichuan Province on Sunday. The Tianlian II-01 satellite, atop a Long March-3B carrier rocket, was launched at 11:51 p.m. local time, and later entered the geosynchronous orbit. 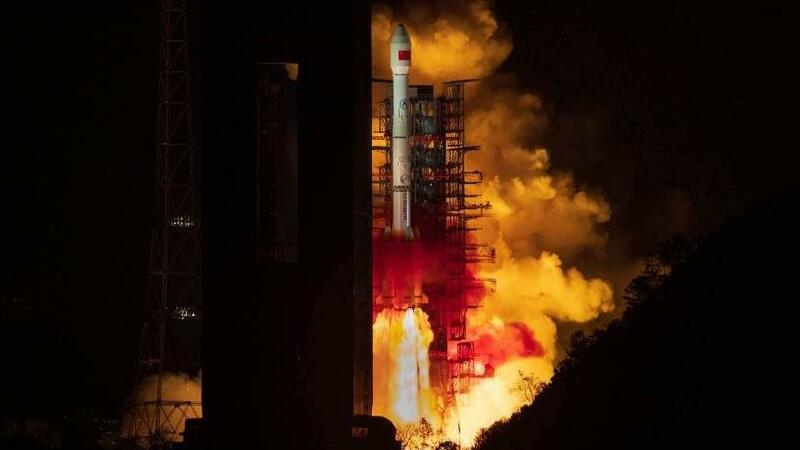 This is the first of China's second-generation data-tracking and relay satellites, which will provide services like data relay, measurement and control, and transmission to manned spacecraft, satellites, carrier rockets and non-spacecraft users. Compared to its predecessor, the Tianlian I system, the new generation relay satellite system will be significantly improved in mission planning, system management and task implementation. With a more advanced data transmission rate and capability of multi-objective service, Tianlian II system will play an important role in improving transmission timeliness, in-orbit operation safety and task implementation flexibility, for medium- and low-Earth-orbit satellites and manned spacecraft. This is the 129th mission for the Xichang Satellite Launch Center, and the 301st mission for the Long March carrier rocket series.